How many states have term limits on their legislatures? 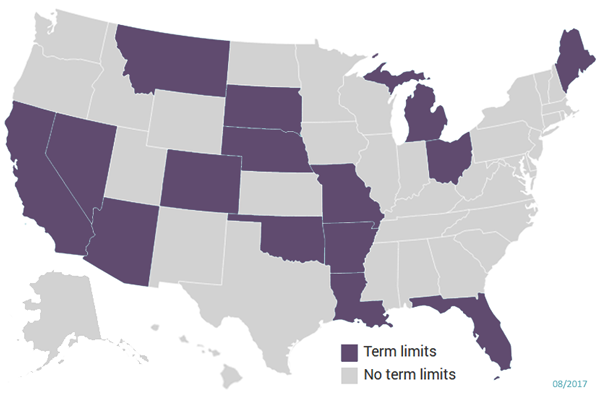 As of December 13, 2018, the number of states with legislative term limits is 15. They are: Arizona, Arkansas, California, Colorado, Florida, Louisiana, Maine, Michigan, Missouri, Montana, Nebraska, Nevada, Ohio, Oklahoma, and South Dakota. Italics Indicate states limited by statute. All others are limited by state constitutional amendment. * Maine’s law is retroactive. ** Law in Louisiana was passed by the state legislature. *** Wyoming’s law was originally passed by initiative in 1994. The legislature amended the law to allow members of the House to serve 12 years. A referendum to return to the original six- year House limits garnered 54% of the vote but failed to get 50% plus one of all voters to veto the legislature. ****California’s term limits were modified by referendum in 2012 to a 12-year cumulative total, either or both houses. The following state’s term limits are consecutive: Arizona, Florida, Louisiana, Maine, Ohio, South Dakota. The following state’s term limits are lifetime: Arkansas, California, Michigan, Missouri, Nevada and Oklahoma. Oregon voters passed term limits on their legislature and statewide officeholders in 1992 by 70% of the vote. Two termed out legislators sued the voters of Oregon in a case that made its way to the Oregon State Supreme Court. In December 2001, the court ruled that the term limits law violated single amendment requirements and threw the law out. Idaho voters passed term limits on their legislature, statewide officeholders and local officeholders in 1994 by 59% of the vote. In 1998, the legislature placed an “advisory” question on the ballot, asking voters to reaffirm their support of term limits. Voters did so. In 2001, state and local office holders sued Idaho voters in a case that made its way to the Idaho Supreme Court, where the court ruled term limits constitutional. In February 2002, the Idaho Legislature ignored the vote of the people and became the first state in the nation to repeal their term limits law. In an effort to block stricter legislative limits, Utah’s legislature placed 12-year limits on its members, a law that was to go into effect in 2006. In March 2003, the legislature repealed their limits. Like, Idaho, Maine, and Wyoming, Utah is a statute-only state, where voters cannot pass constitutional amendments. All of the above have gubernatorial limits in addition to 20 other states. Twenty-three states (AK, AR, AZ, CA, CO, FL, ID, ME, MA, MI, MO, MT, NE, NH, NV, ND, OH, OK, OR, SD, UT, WA, and WY) passed federal congressional term limits at the state level before the 5-4 U.S. Supreme Court decision in U.S. Term Limits v. Thornton declared the requirement of a constitutional amendment to limit the terms of Congress. These statutes are still on the books, however, they are not enforceable unless the Supreme Court decision is overturned.